Street flooding from the July 19, 2018 rainstorm in Ellendale, ND. The storm dumped 7.5 inches of water in 5-6 hours, overwhelming the city's sewer system and flooding many basements with up to 3-4 feet of water. Photo courtesy of KVLY TV, sent in by a local resident. The North Dakota Community Foundation (NDCF) has established the Ellendale Flood Relief Fund to assist individuals affected by the July 19th flooding event in Ellendale, ND. 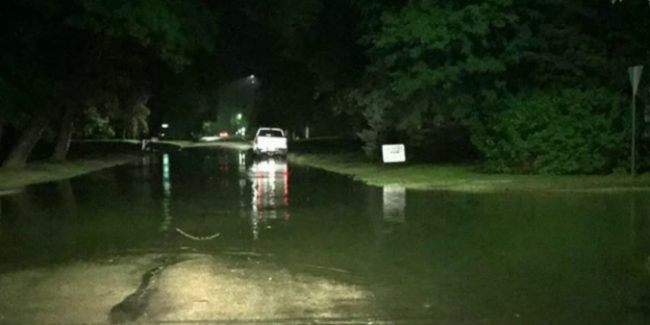 A severe storm dumped 7.5 inches of rain in 5-6 hours, overwhelming the city's sewer system and causing damage to homes, businesses, and churches. All gifts to the Ellendale Flood Relief Fund are tax-deductible as charitable contributions. NDCF will waive its usual management fees so 100% of gifts will go to the disaster response (online credit card donation fees still apply). You will receive a tax receipt from NDCF for your gift. Funds will be granted to the Lutheran Social Services Unmet Needs Committee, which provides direct assistance to individuals and is providing case management services to victims of the storm. Questions about making a donation should be directed to the NDCF main office at 701-222-8349. Thank you for your concern for our fellow North Dakotans!